Alpha Version 8 : Squad – Communicate. Coordinate. Conquer. The hype train has arrived! A monthly recap and Version 8 in one go! Alpha Version 8 is now released. 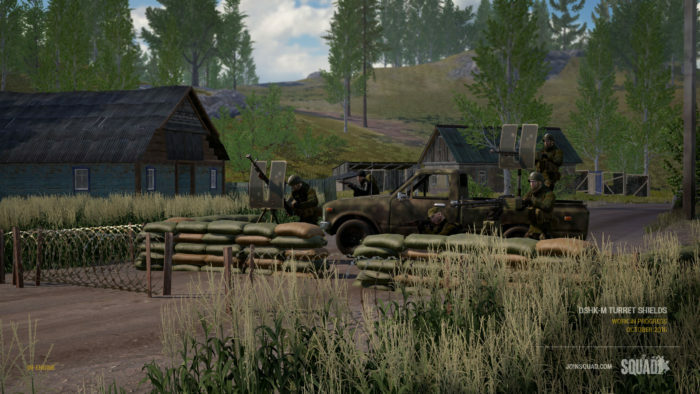 After hitting one of Squad’s biggest milestones with the introduction of vehicles in Alpha Version 7, we could finally focus on doing an optimization pass on the core systems now that all the underlying wires are connected. This was a team wide effort, with a lot of micro-optimizations quickly building up to a level of performance that the team is proud to present to the players. That is not the whole story though! We added a few treats to add more spice to the current gameplay and quite a few quality of life improvements alongside the main focus which was optimization. As more content and features are added, we’re able to better pace the game to where we eventually want to go. These changes have to be implemented over time so the player base has a chance to adjust and adapt. This has been the trend for for the entire life cycle of Squad, and this patch is no different. We are steadily slowing things down so there is more time to breathe and those engagements feel more significant. Version 8 is now available via Steam and below is a full changelog. We’ve done a major optimization pass over almost every single system in Squad. We’ve improved collision and physics performance, graphical and GPU performance, multithreaded major pieces of the game such as animations and vehicle updates, and many more performance improvements. Additionally, Effects have had a wholesale overhaul after some detailed profiling on both Intel and AMD machines. Optimization of shader implementations and a detailed pass over configs and best practices gave us a 10x improvement in performance of effects. 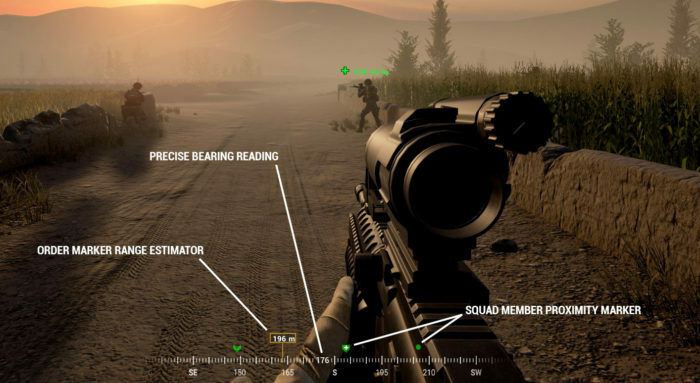 This should greatly improve reliability of frame rate in large firefights. There is still a bit of work to do but the results we’ve seen are already worth the effort. As always, we will continue to improve the performance and optimize the game with every patch. Added improvised rocket artillery variant of the technical for both Insurgents and Militia factions. 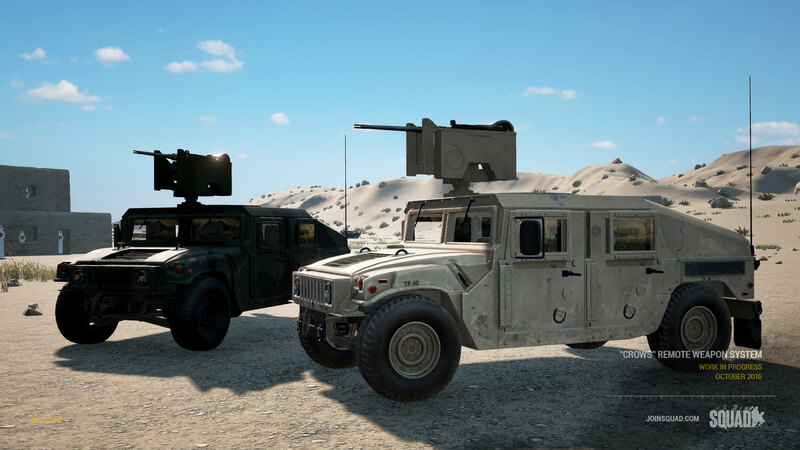 This vehicle is hard to aim and use effectively, especially without the aid of a forward spotter and communication between driver, gunner and observer. Rocket artillery technicals can only be found in small numbers on large maps such as Yehorivka, Kohat and Chora. They are worth 20 tickets on destruction and have a respawn timer of 18 minutes, so stay out of trouble! on top, with an M2A1 mounted on it. This will provide much better protection for the gunner as he is safely inside of the vehicle, with magnified optics on his .50 cal machine gun. Be mindful of the long reload time. They are worth 20 tickets on destruction. 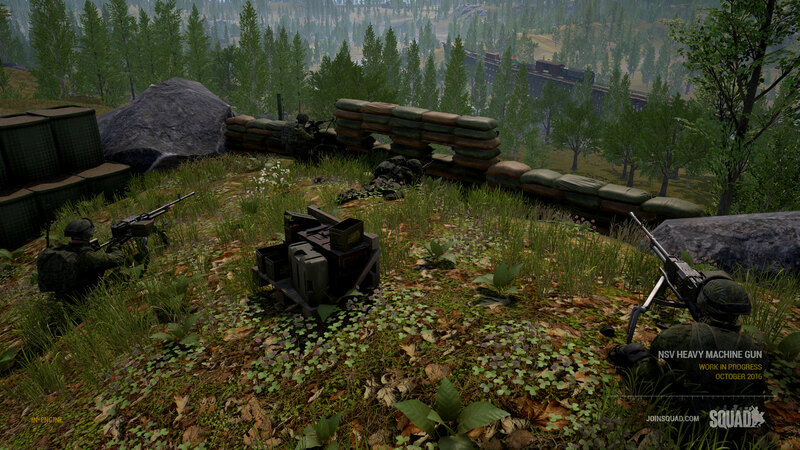 Added NSV heavy machine gun emplacement (Russians are sometimes right!) to the Russian faction. 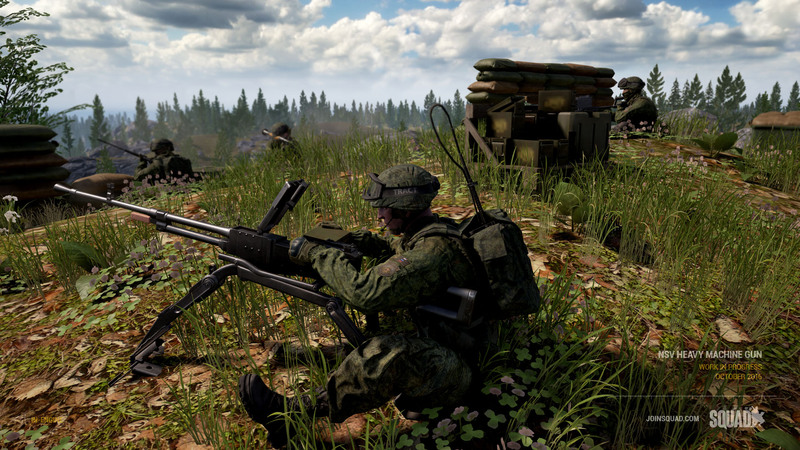 Firing at a blitzing 700 rounds per minute, this HMG is certainly a force to be reckoned with. It comes in both tripod and bunker form. Build cost is unchanged from the placeholder they have been using up until now. Added a forward facing shield to the Dshk machine gun. This can be found on both the deployable as well as the vehicle mounted version. There are still unshielded versions available for those that prefer greater visibility over front facing protection. Added experimental environment penetration for heavy machine gun calibers. We will be watching closely, if all goes well expect small arms to get a similar treatment in the future. Added penalty to weapon sway when you have low stamina. The lower the stamina the worse the sway will get. Be aware of your movement in hostile territory. Slightly increased visual suppression effects across all weapons. 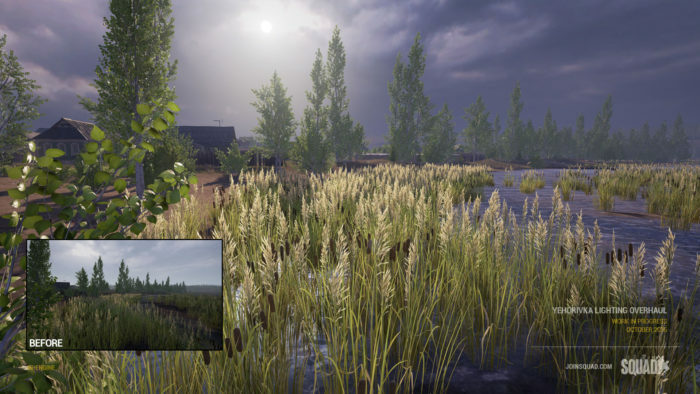 We have done a huge lighting pass on all the maps in order to unify the quality and look of the game. Each map now has at least two lighting scenarios using custom skyboxes in order to provide variety and to help players identify gameplay layers more easily. Some key areas such as Fools Road tunnels got a complete overhaul as well, using lighting to help direct players. Additionally, our post processing has been unified to ensure effects such as bloom, ambient occlusion and lens flares are enhancing all our maps. In the future we will continue to push our lighting tech further but in this pass we had to be careful not to work against our main focus for this update, optimization. We’ve dramatically improved the Server Browser, switching to an asynchronous update method where results are streamed in as they come in. We’ve also improved the sorting, so that server entries are sorted immediately upon being added to the browser and fixed a number of issues where the server browser would show incorrect results or fail to refresh. Our new programmer Zak, with some help, has vastly improved the Graphics Menu, improving a number of options and simplifying some of the more complex choices in the menu. We’ve also spent some time to auto detect a number of settings that were previously exposed, as we’ve found that incorrectly setting them would negatively impact users performance. Finally, we’ve added a few tooltips to explain what each option does to help users better understand the performance impact of changing certain graphics options. We also added a button that will clear out your cached user settings, just in case something goes horribly wrong. Increased base spawn timers for FOBs and RPs by an additional 15 seconds. 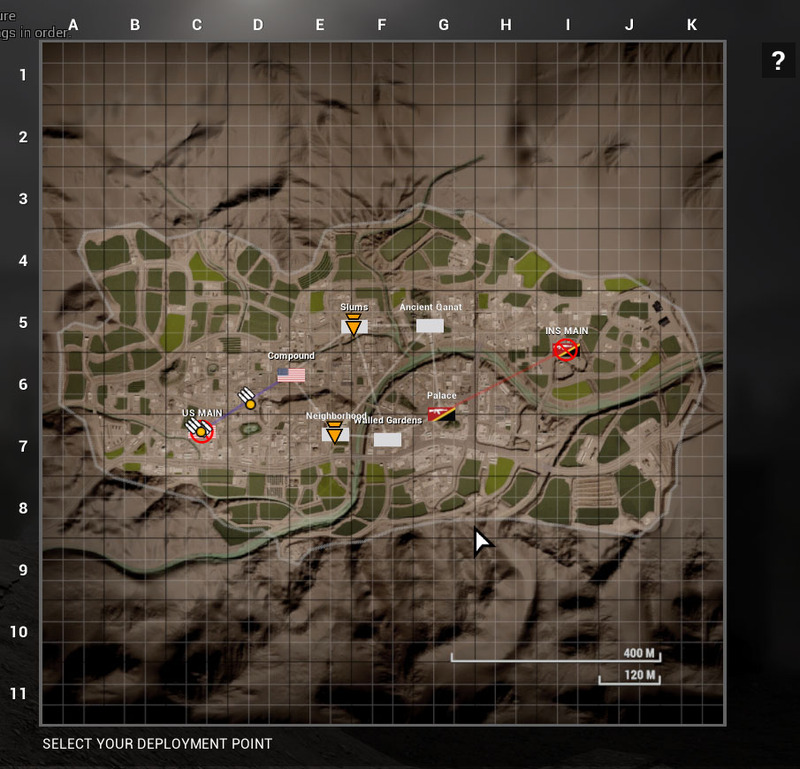 Added scoring for logistics drop off based on the amount of ammo and supplies that were successfully absorbed by the FOB. The score is also given to any passengers in a logistics vehicle as a reward for them escorting it safely to its destination. Reloading an emplaced heavy machine gun at a FOB now costs 50 ammo points. Reloading a vehicle carried .50 cal (M2/Dshk) now costs 75 ammo points per magazine at a FOB. Reloading a BTR now costs 50 ammo points per magazine of KPVT API ammo. Reloading the CROWS at a FOB costs 175 ammo points per magazine. Reloading the improvised rocket artillery technical at a FOB costs 300 ammo points. Note that the rocket technicals rocket pod has to be completely empty of ammo before a rearm is possible. Logistic drivers now receive points for delivering resources to a FOB. Heavy machine guns now do even more damage versus infantry targets. Damage versus vehicles remain the same. ability like most handheld weapons have, giving you a better sight picture for those critical shots. Minor pass on differentiating the way each weapon deals damage, especially at range. US Automatic Riflemans M249 now has a small and lighter 100 round bag (was 200 round boxes before). Total ammo capacity increased by 100 and weapon sway is slightly lower. 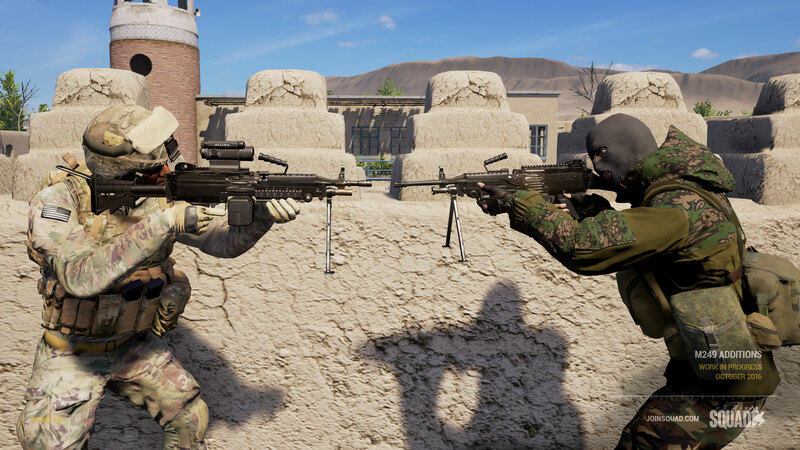 Militia got a new version of the M249 SAW, an old school long barreled version with a bit more range than the shortened version. It retains the heavy 200 round ammo boxes. Intel required to reveal caches to the BLUFOR factions has been increased by 33% on 4k INS maps and 50% on 2k INS map respectively. 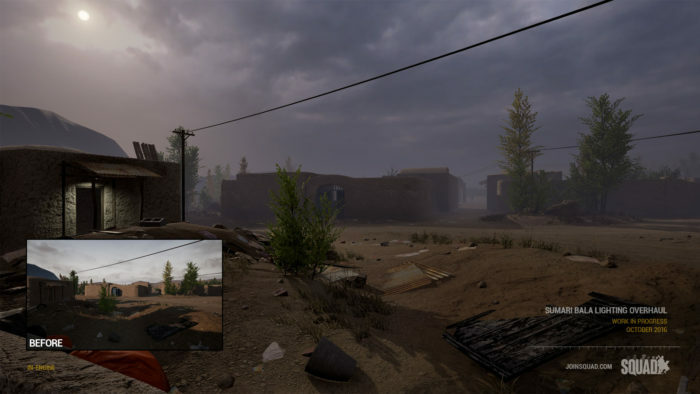 Added exclusion zones to weapons caches for the Insurgency game mode, so that you cannot bury the cache in deployables. For this release the radius is set to 20m around the cache. Replaced about 50% of regular M1151 Enhanced Armament Carriers with the CROWS variant. Replaced about 50% of regular Dshk Technicals with a version that has a turret shield. Added scoring for vehicle drivers when their gunners kill something, rewarding the driver equally as it was a team effort. Reduced the ticket value on loss of a regular M1151 Enhanced Armament Carrier to 12 (was 16). so that number keys are freed up for vehicle inventories. Removed redundant vehicles from several map layers. Mostly a few transport trucks on maps like Yehorivka, Kohat and Chora as well as the a few M1151 Enhanced Armament Carriers or Technicals on larger Insurgency layers. Vehicles now behave differently depending on the surface the wheels are contacting. Improved the game load time by assuming all packages were created with the latest version of the Unreal Engine. Improved the conversion of FNames to FStrings, bringing about a major improvement to the games startup time and a general performance boost while in game and spawning actors. Fixed incorrect inlining in C++ functions related to getting bone rotations, bringing about a modest performance increase with animating bodies. Improved the performance of the Serialize function, improving load times and network replication times. Improved Capture Zone Resource Components by removing their ability to tick. Optimized Soldier Ragdoll Component by ensuring location finding only happens on the server. Optimized Vehicle flipped traces to only run when the vehicle wheels are not touching the ground and only once a second. Optimized Placeable Map Markers by removing their tick dependencies. Deployables, Insurgency Caches, and Vehicle Wrecks have been set to static mobility, improving collision detection time. Optimized radial menu by reducing the number of layers to update. Moved compass to C++ and simplified the underlying logic. Fixed ejected gun shells colliding too many times. Fixed engine code going through all bones every tick and removing spaces, improving load times and object spawning time. For those with underperforming CPUs you can now use Low or Medium Effects Quality setting to reduce the CPU cost of effects. Their tick rate is now dependent upon your effects quality setting and many other effects have varying culling distances set based upon your Effect Quality setting. Improved performance on particle effects that used Ribbons. Footsteps, bullet impacts, muzzle effects, shell ejections, shockwaves, deployable effects, shovel effects, and many other particle effects will now cull based upon your Effect Quality setting and distance to them, previously they always ran PhysX raytraces even if they would never be seen or created. Streaming texture pool is now detected automatically based on your GPU, fixing a number of issues were incorrectly setting this value would cause massive performance problems. Major improvement to animation system: All variables have been fast path enabled and the main update threads are now multithreaded; The event graph has been moved to C++ running in parallel with the game thread (Note: We arent finished with this yet, More improvements are on the way). Simplified Vehicle Collision Bodies, using a smaller number of simpler shapes, improving physics performance with many vehicles. Improved the Vehicle Manager to update every vehicle in parallel, improving the physics performance with vehicles. Removed an unnecessary animating mesh from the soldier. Fixed certain situations where you could not change to bandage or certain other weapon groups after changing role at an ammo crate. Your last selected weapon in a group (grenades, healing items etc.) is now also saved when you access them via the scrolling. Updated soldier ragdolls to be more stable when reviving around buildings and vehicles. Fixed weapons not being properly hidden in vehicles. Fixed soldiers not being properly unhidden when getting out of vehicles. Fixed inputs sticking when getting in and out of vehicles. Fixed issue where unable to reload emplaced weapons even after playing the reload animation. We’ve added all new artwork with more functionality. New player icon artwork has been added for squad leader and medic, making them easier to see in groups of squad members. Current bearing is now displayed in the middle of the compass, all vehicle positions now work correctly with the compass, and compass now fades out towards the edges. We’ve also done a complete rewrite of the compass in C++ for better performance. 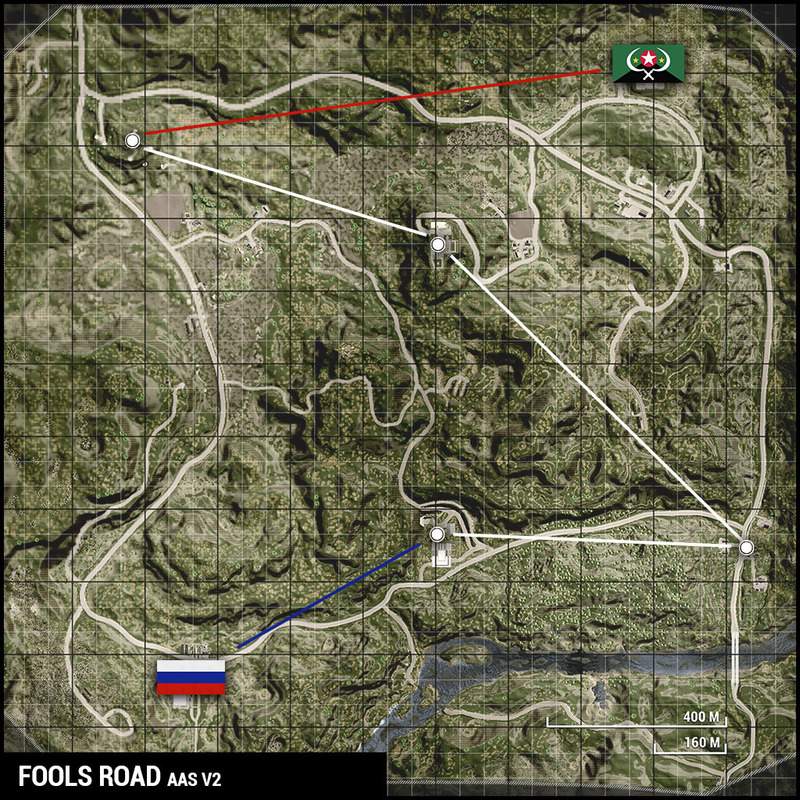 The direction and distance to the latest squad marker is now shown on the compass in increasingly larger meter increments. map markers allowed on the map from 3 to 5. Updated the Rally Point action text to display the actual distance required for squad members to be near SL to place. Current number of magazines or number of items is now shown when necessary or hidden for non-expendable items. 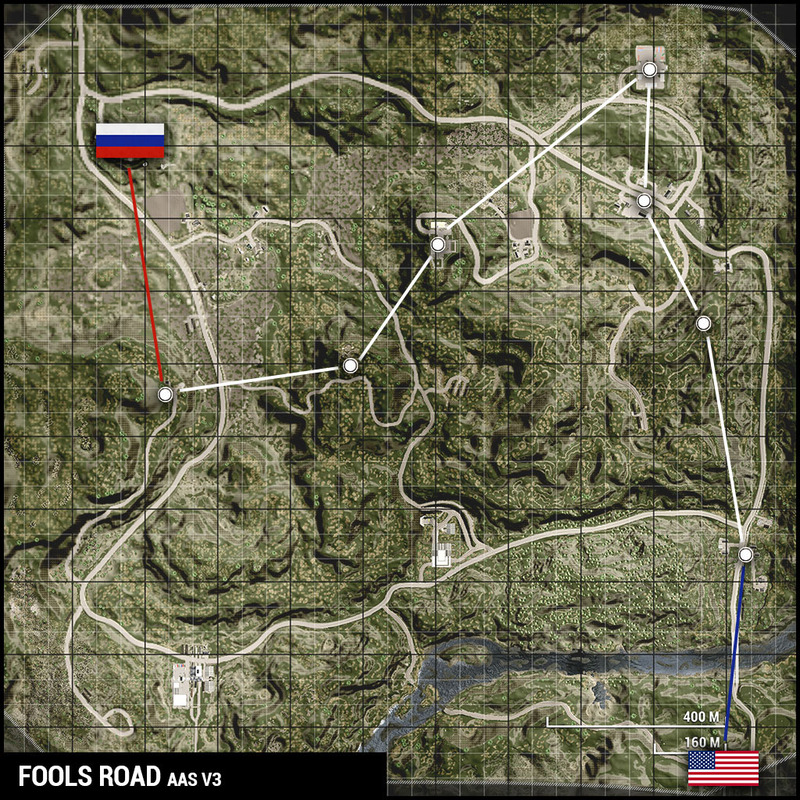 Maps now show lines indicating the capture order of flags. Vehicles are now always color coded correctly. Added new Yehorivka AAS v2 layer. 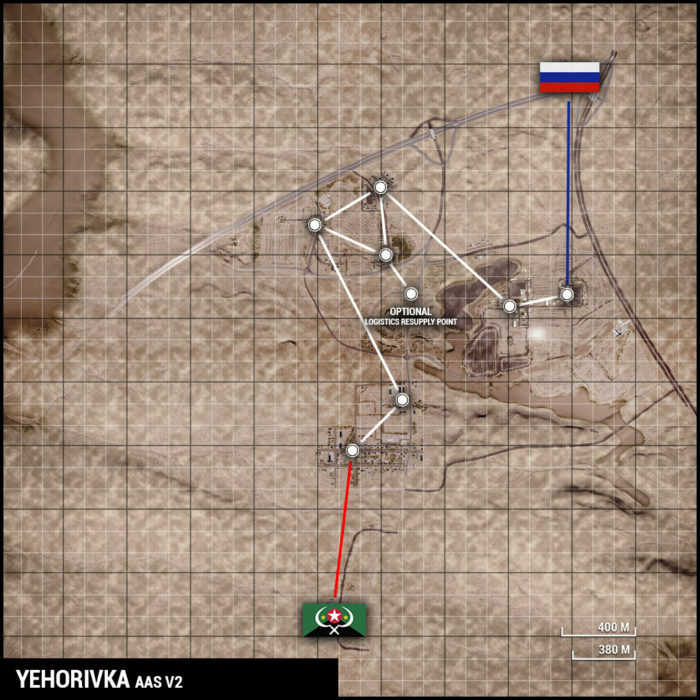 This layer features Russia vs Militia and it also features an experimental optional objective in the AAS capture chain. It is possible to capture a resupply point that your logistics trucks can resupply at, rather than drive all the way back to your Main Base. and is unlocked by capping Train Station or Fortress. Fortress is no longer the focal point of AASv2, the lattice has been updated to include a Village north of the main bridge located on the SE side of the map. Russia and the US are now squaring off against each other in a 7 flag layer that spans the majority of Fools Road. Lattice has been changed to a more linear setup with Hilltop being the primary focus. 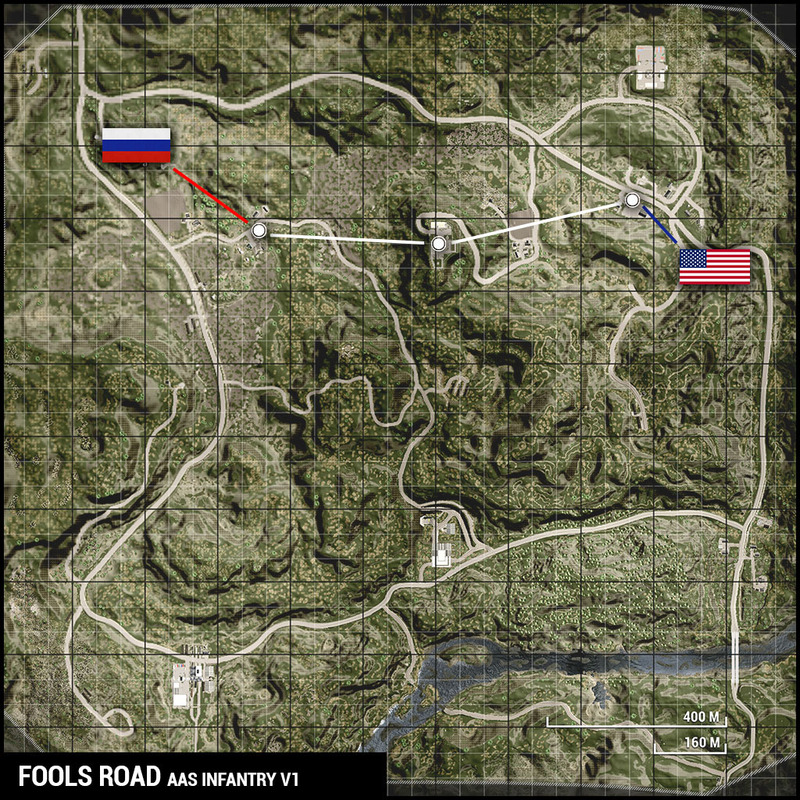 A nasty conflict has broken out between the US and Russia against a strategic location, the Train Station. 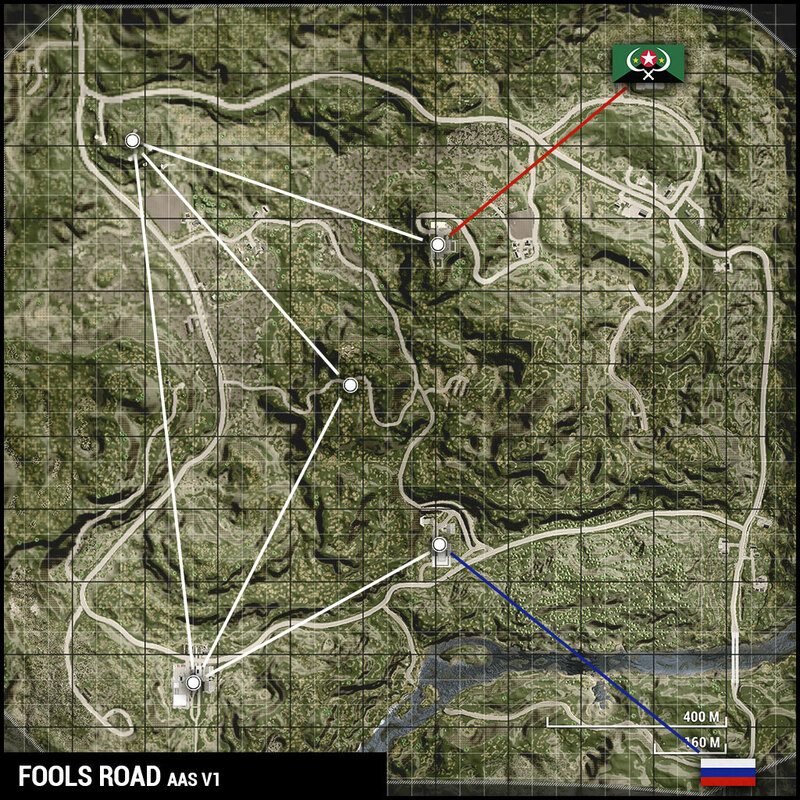 Fixed an issue where some Insurgents and Russian FOB radio cues were virtually silent compared to the other factions. New engine sounds for BTR and the trucks. Added rocket pod sounds. Fire and explosions. Added a volume ducking for interior engine sounds when speaking on VOIP. 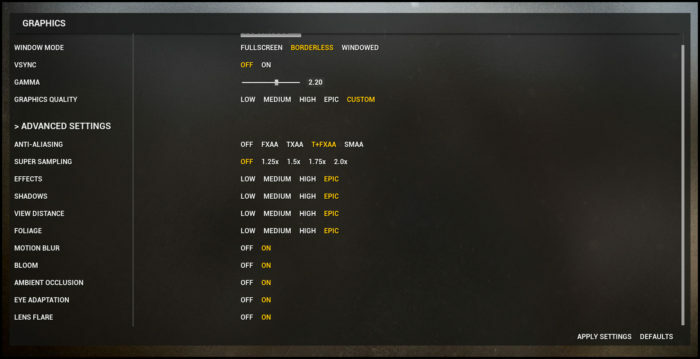 in the Game Settings Window. This requires a restart of the game and we highly suggest everyone does it at least once to clear old obsolete settings from your config. Performance debug can now be toggled in the game settings menu. This will give you an overview of how your CPU and GPU are performing in the game. Before we sign off we’d like to draw people’s attention to the recently revamped Squad Wiki! 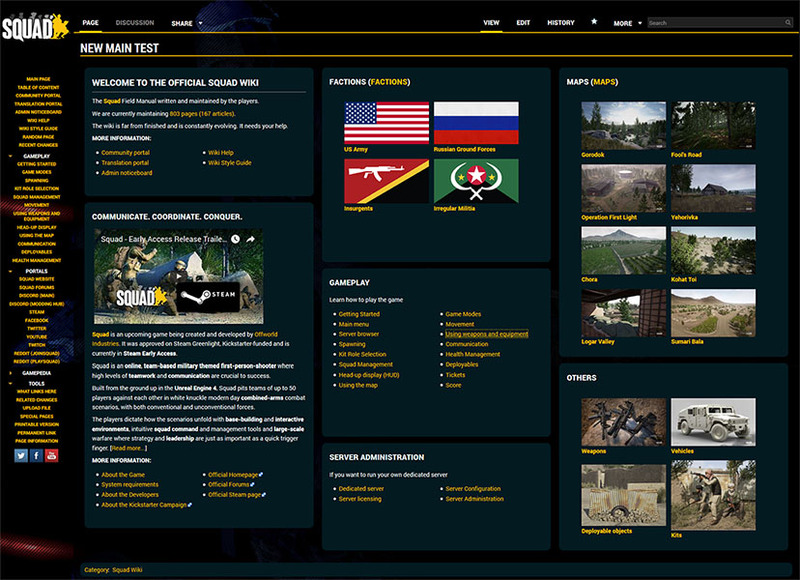 Wiki Admins TomNedry and Usgu have worked hard at improving the overall look of the site to bring it in line with the main website and forums. Underneath there’s still a lot of work that needs to be done, and this will continue as the game develops. If you are interested in contributing to the wiki, head over to the Community Portal, or even better, get in touch with TomNedry and Usgu – they are always looking for helping hands.